The snow, the views, and the lack of crowds makes Ski Cooper (not Copper) a local favorite! 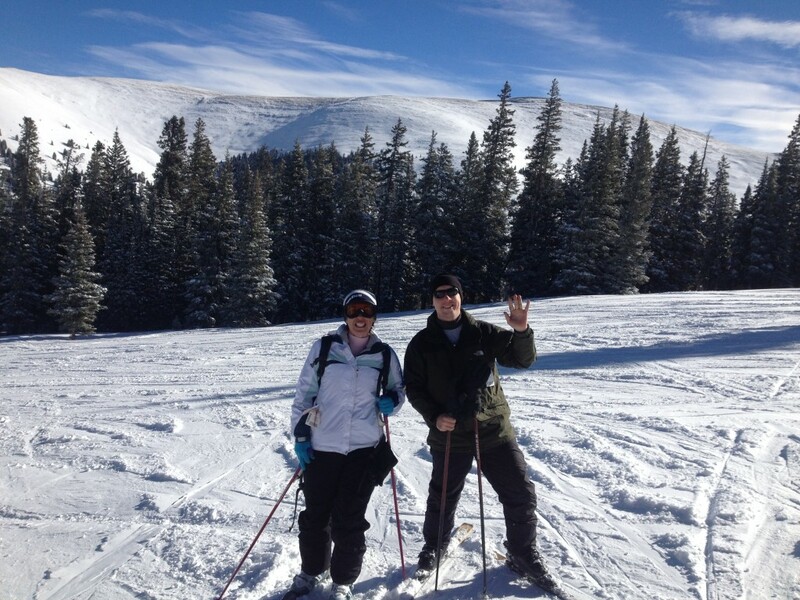 Our family took two day trips over two consecutive weekends to Ski Cooper, a small resort just north of Leadville, Colorado. The lift tickets are very inexpensive, there were never lift lines, and we took advantage of the boys getting to take two full days of lessons through the resort’s “Panda Patrol” program. I have to make clear here — such as what I put in the title — that we did not go to Copper Mountain, which is often what Google hands back to you when you Google anything like “skiing cooper” or something like that. Copper is a much bigger, more vacation-resort-type of ski area, but is only about 20 miles north of Cooper. That’s not where we went. With the kids happy in Panda Patrol, Dave and I were able to enjoy 5 hours of skiing each of the days to our hearts’ content; for Colorado, this is a very simple resort, with almost no frills, but plenty of great snow. There’s a small restaurant and bar at the base, and the lifts are among the slowest we’ve ever experienced. Dave and I were taking 10-12 minutes to go up, 2-3 minutes to come down. The first weekend we went up was the day after a 12″ snowfall on the resort. Dave and I were carving trails in fresh powder and we both agreed it was the best snow conditions we’d ever experienced in all the years he and I had been skiing (Dave about 30 years, me about 20). The views from the tops of the lifts were magnificent. We were near Mt. Elbert, the highest point in Colorado. I tried my hand at glade skiing for the first time last weekend…Dave had done plenty of glade skiing as a teenager on his ski trips in New England, but this was new territory for me. Let me tell you — glade skiing can kiss my rear end! Glades are ski trails through trees. You have to be able to take turns precisely when needed, and sometimes those turns need to be pretty tight to avoid hitting a tree. I followed Dave into a trail called “Corkscrew”, which was rated as a black diamond. I kept missing my turns and skiing right into very deep snow banks. I never thought the trail was going to end! I must have fallen or otherwise gotten buried a half dozen times, and at 11000′ elevation it’s quite a workout just trying to climb out. 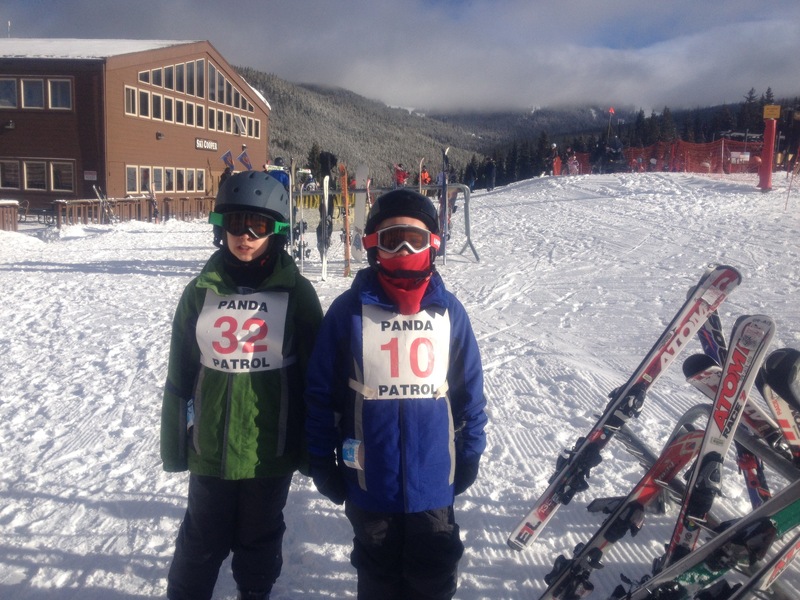 While Dave was constantly rescuing me from one snow pack after another in the glades, the kids were enjoying their second consecutive weekend of ski lessons with the all-day Panda Patrol program. Dave and I priced out all of the smaller resorts in Colorado and the Ski Cooper program was the most reasonably-priced: ski lessons, rentals, and a lunch were only $95. The kids were with the instructors for two hours in the morning, and two hours in the afternoon, with one hour for lunch. Both weekends, the boys really enjoyed their lessons and they were lucky to have the same really-nice instructor, named Dugan, for both weekends. The boys ready for their Panda Patrol lessons. 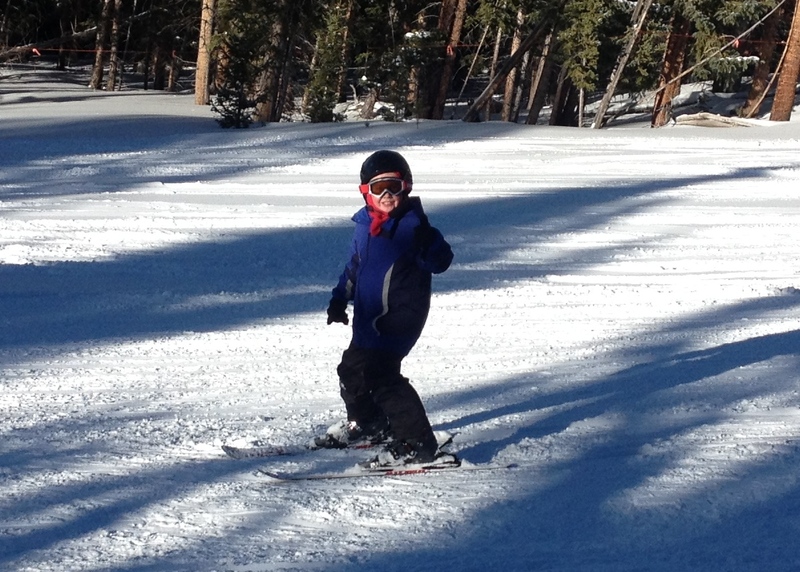 Timmy took to the ski lessons much more aggressively than Jacob, who is always the more careful of my two sons. The kids were finished with their lessons at 3pm both days, and Timmy was happy to tackle some beginner (green) trails with us, while Jacob was more tired and was content to put back on his regular shoes and take it easy for the rest of the afternoon. 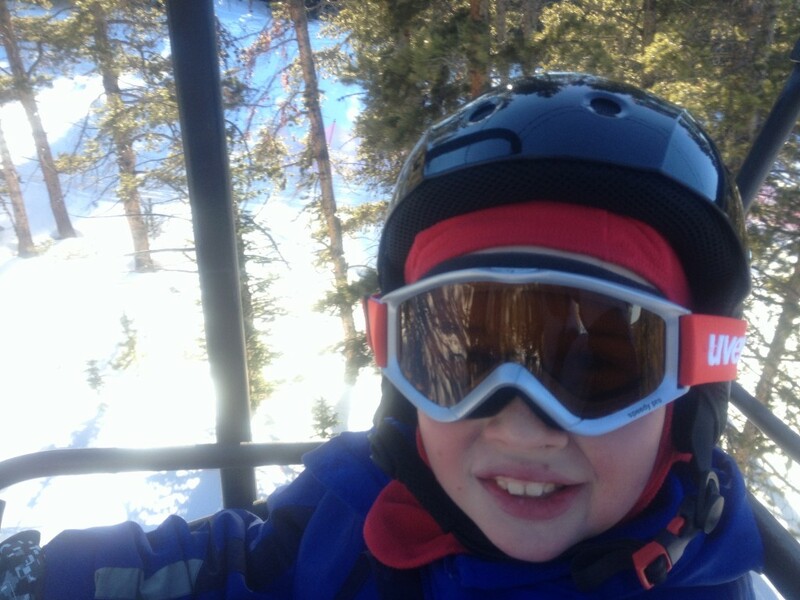 Timmy on a chair lift. After the two consecutive weekends of ski lessons, we think the boys are ready to start working on their skills out on the slopes. Our next trip will probably be another day trip to Monarch in February, and Dave and I will take turns staying with the boys on the green (beginner) trails. Jacob can use his Colorado Ski Passport for 5th graders, a wonderful promotion that we were so lucky to grab for Jacob this season. He gets 4 days of free skiing at each of 20 resorts around the state. I don’t mind sticking with the kids at all, it’s been wonderful seeing the boys get better at skiing and enjoy it as much as I hoped they would. Happy Timmy on a green run with Dave. Ski Cooper is located about 10 miles north of Leadville, Colorado, on U.S. Highway 24. From Colorado Springs it’s a 2:45-3:00 hour drive, but make sure you plan your trip properly. There are very few food and bathroom stops. Enjoy the antelope, cattle, elk, and buffalo herds grazing as you cross the Colorado South Park and Arkansas River Valley on the route. 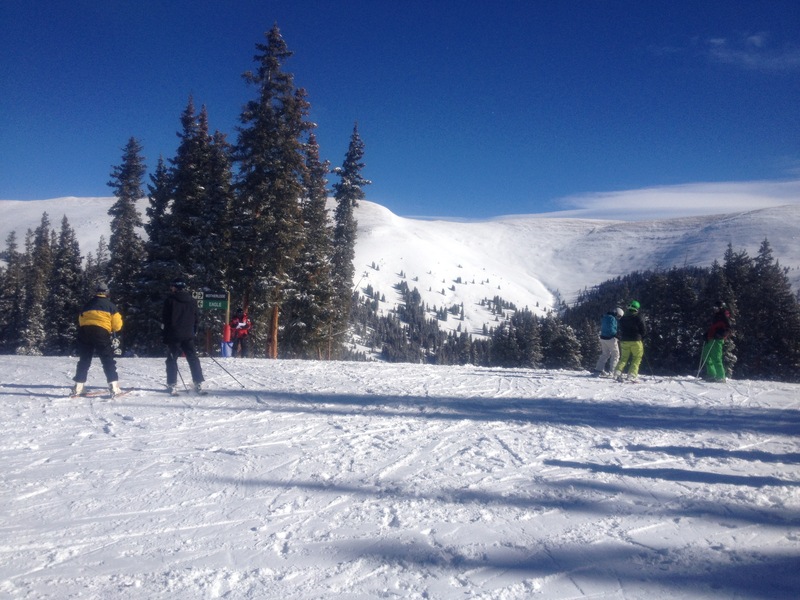 Lift tickets are among the least expensive in all of Colorado, $47/day for adults ($40-42 for military depending on whether you get them at the mountain or at the base) and $27/day for children. I will close now with two videos, the first is of Dave coming down a small mogul hill on one of Cooper’s black diamond trails. The other is of the boys following their instructor, Dugan, down the training hill. Timmy’s in blue, Jacob’s in green.